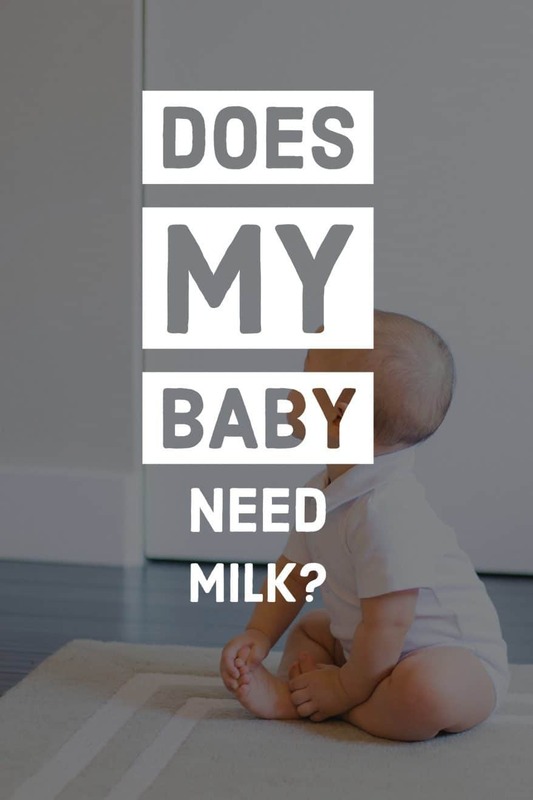 I get a lot of questions about milk for babies… like when should I be introducing baby to milk, or how much milk should they drink? 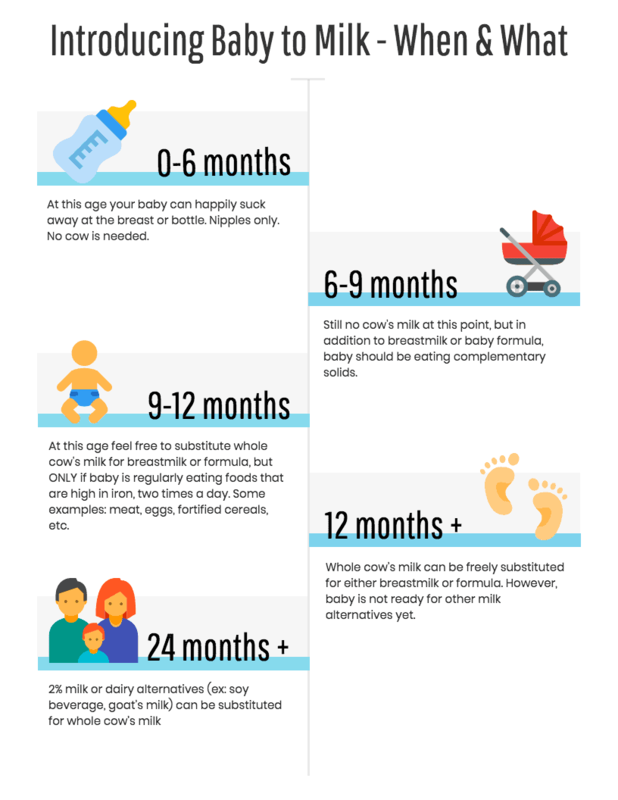 Your baby definitely needs milk, but the type of milk is key, depending on the baby’s age. If you’re providing breast milk for baby, your milk also contains additional benefits like immune antibodies, probiotics, and prebiotics. This milk is so good for your baby, there’s really no need to introduce baby to any other kind of milk. Similarly, formula is made specifically for your baby’s nutritional needs, so there’s no need to supplement formula with other kinds of milk. However, that doesn’t mean you CAN’T supplement with cow’s milk or other milks, once your baby is old enough. Magnesium 8 26 28 39 6% 36 10 ? Folate 13 DFE 13 DFE 13 DFE 23 37 DFE (3 naturally occurring) 96 DFE ? Babies were designed to grow optimally on breastmilk. So when considering milk for baby, it’s very important to make any transition slowly. Formulas replicate the breastmilk optimization as best as possible, so the same goes for the transition from baby formula to other foods. Milk for babies is important because they’re accustomed to getting their calories in liquid form. You may not realize the significant contribution milk makes to the caloric intake of a baby. At 12 months, a child gets approximately 35-40% of their calories from milk. So it’s recommended that a child over 12 months continue drinking between 2-3 cups of milk. This is 314-461 calories. There are problematic differences between breastmilk and other milk for baby. Babies’ bodies have not yet developed to the point that they can regulate things like increased levels of sodium. Because of this, introducing baby to milk too early can be dangerous! If you look at the sodium levels, you’ll see that breastmilk is relatively low in sodium. As the body develops, the kidneys will be able to refilter sodium, but in early infancy we need to be careful about not feeding them food that they’re not yet ready to handle. why not soy milk or goat’s milk or rice milk or…? Many of my clients ask about other kinds of milk for baby, wondering when it’s okay to introduce these milk alternatives. Unfortunately, none of those milks alternatives are appropriate for children under two years of age (unless directed under medical or dietetic supervision). If a child is no longer breastfeeding and is unable to drink whole cow’s milk, formula should be given. Goat’s milk is naturally low in folate. If goat’s milk is offered to children it should be whole fat goat’s milk fortified with folic acid (synthetic folate). Soy beverage is low in fat and slightly low in protein. Rice, almond, coconut, hemp, and pretty much all other milk alternatives are low in protein, fat, and calories. There have been cases where infants have developed nutrient deficiencies when they’ve been fed an inappropriate milk alternative without supervision by a nutrition professional. This 11 month old baby in Spain developed scurvy, a severe form of Vitamin C deficiency, after consuming almond milk almost exclusively from two months old. This 22 month old baby was found severely lacking in protein and calories after being weaned from breastmilk to a rice beverage at 13 months. In the 70s, childhood obesity was on the rise. With good intentions to reduce this trend, some physicians started to recommend that infants be given skim (fat-free) milk. However, this study shows babies fed skim milk deplete their fat stores to maintain growth in length. Children need the fat for brain development and the additional calories fat provides for growth. how much milk should baby drink? For the most part, I tell parents to follow Ellyn Satter’s division of responsibility. According to this plan, caregivers decide what, when, and where food is offered, but the child decides whether they’ll eat and how much they’ll eat. I’ll emphasize that last part: you, the caregiver, don’t set a minimum or maximum amount of food. Milk, however, can be the exception. I don’t recommend forcing children to drink milk if they don’t like it. For those children, you’ll need to be more creative in offering dairy or alternatives in a way they’ll accept (example: cook oatmeal in milk instead of water). Alternatively, there are children who will happily guzzle milk all day long, to the point where they won’t eat much else. This means a milk restriction will be needed for those children. conclusion – is milk for babies? Historically, this question would not have popped into anyone’s minds. In today’s Western culture, most mothers wean a lot earlier than our ancestors would have. Without wanting to sound too alarmist, the type and amount of beverages a young child drinks is rather important to their growth and development. 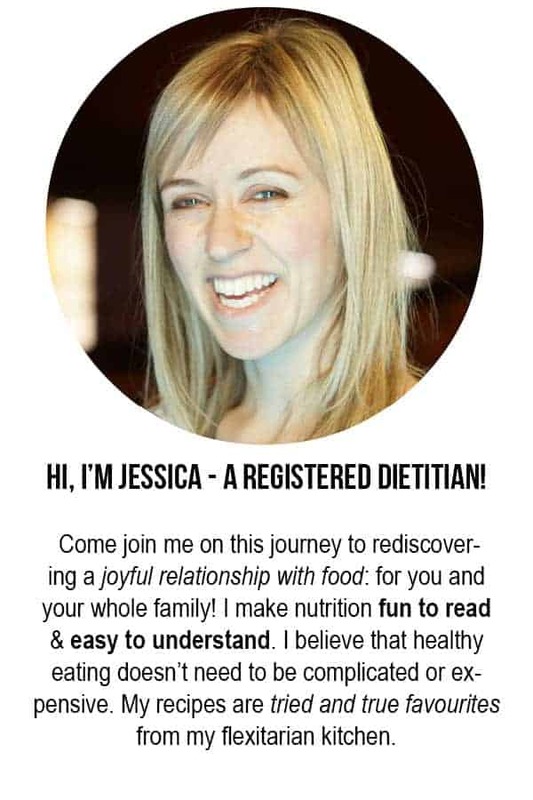 If you are concerned about your child’s intake please seek out the expertise of a Registered Dietitian! We can help you develop a feeding plan that will work with your family’s eating preferences (eg: veganism), your child’s food tolerances/intolerances, and your child’s food preferences…..all while meeting his or her nutritional needs! For more reading on infant nutrition, check out these articles! Thank you for the great info. I am a fellow RDN and mom of a (DOB 12-8-17)1 year old. We are transiting him to whole milk. While introducing foods to him came really easy…switching to milk has been quite confusing. I breastfed most of his life but we did fade into formula toward the end of his first year. We have such a great routine/schedule at this time giving him 3 balanced meals, with his sip cup filled with water and then bottle with milk/formula between per his daily needs. He usually takes 25-30oz from bottle and 5oz of water from cup. My plan at this time is to simply start switch offering him milk with meals and water cup between. I guess I will have to just let him guide us with his daily intake and his food intake will increase as he gets used to drinking less formula filled bottles. I am sure there will be days he eats less solid foods and I worry. Any tips about this transition are greatly appreciated. 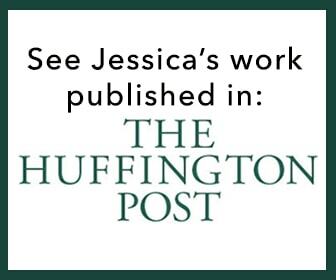 Hey Jess! At one year most babies will need to eat solids about 5-6x/day. They have small stomachs and big appetites! Limit the dairy milk to 2-3 cups/day and babies will make up the rest of their calorie needs with food. It all depends on how many iron containing foods she’s eating!